In The Art of Language Invention: From Horse-Lords to Dark Elves, the Words Behind World-Building, Peterson delivers a creative guide to language construction. With chapters on sounds, words, language evolution and the written word, he brings the reader deep into the world of linguistics and language structure. He gets into the details of sound systems, intonations, grammatical gender, phonological evolution, orthography and so much more. Each chapter is followed by a case study related to the topic. These delve deeper into Peterson's languages, providing a glimpse into his creative process. I started out reading this book from the beginning, but I will admit that I soon realized it was not a book for me to just sit down and read. I did find the sections that I read to be informative without being dry. Peterson obviously loves what he does; his passion comes through with his writing. I am not, however, in the process of creating a language myself, so I'm not really the target audience for this book. I jumped around quite a bit and learned a lot about linguistics and the way languages work. It's pretty amazing, actually. 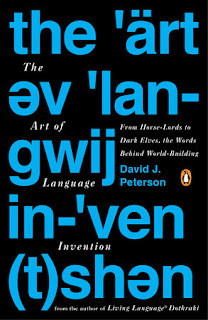 While I wouldn't recommend this book to just any reader, I would highly recommend it to anyone who is interested in creating a language or who is looking for a more interesting way to learn about linguistics. The level of detail and explanation that Peterson provides is extremely valuable, and his own experiences are even more so. This review was written based on a copy of The Art of Language Invention that I received from the publisher in exchange for an honest review. This post includes Amazon Affiliate links. If you purchase something using my link, I will receive a very small commission but your price does not change.